This remarkable graphic novel recounts the epic life journey of Bertrand Russell, who is driven to find absolute truth at the cost of almost everything else. Russell's greatest fear is of falling into madness and this fear drives him to a passion for rationality beyond all other distractions in life. Russell discusses his passion for rationality and his need to find absolute truth with great thinkers such as Gottlob Frege, David Hilbert, Kurt Gödel, and Alfred Whitehead. He also becomes the mentor of the passionate, but perhaps sometimes mad himself, logician Ludwig Wittgenstein. All of these influential men, however, are still just men. This is the same fault that Russell continually finds in himself as he tries, and continually fails, to establish logical foundations for mathematical axioms. Despite all obstacles and distractions, love and war, sacrificing his own personal life and happiness, even finding himself dangerously close to the edge of true insanity, he persists and subsequently finds "The price you pay for absolute certainty." He is an admirable hero, and sometimes antihero, who is a mere man seeking answers to the most basic questions in our everyday lives. Why does 1 + 1 = 2? Should I support the war my country is now participating in? These questions seem miles apart in philosophical ideology, but Russell sees that they are more closely related than we could imagine and through the journey that is Logicomix he will show us how. Logicomix is a historical fiction piece that gives a very accessible explanation for some of the most important ideas in modern mathematics and philosophy. At first it seems not only unconventional, but ridiculous to have such concepts put into this artistic medium, but somehow they pull it off and they pull it off exceptionally. I found myself engaged and enthralled by the atmosphere that the artists created. There were just enough details without having a sense of being overwhelmed by information and at times I was able to simply enjoy the art and story. The characters were unique and exciting, despite most of them being dead and obsessed with math, of all things, while they were alive. At times lighthearted, but deeply layered with an inner struggle to find knowledge of our vague understanding of reality, this story is a great read for all people who desire to better understand truth. I will say that there are many people who would not see fit to give this book a 5 out of 5 star rating, because it is a book for nerds. If you do not care about philosophy, logic, math, pacifism, Bertrand Russell, or reading a comic about a heroic man who is not necessarily super or powerful, then you would probably not find this book appealing. If you do care about one or more of those things, then you will not be disappointed in taking the time to read this unusual book. It is a rare find and an ingenious read. 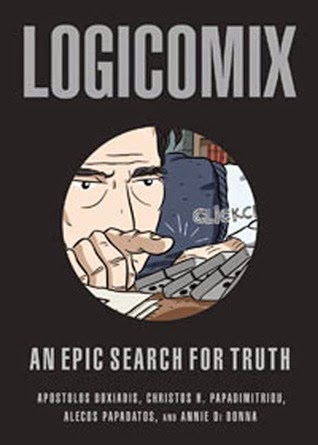 My favorite quote from Logicomix: "Logicians hate contradictions... but what is life, in the tragic view which you espouse, if not a bundle of contradictions?" The most logical thing to drink while reading this book is Earl Grey Tea. This black tea infused with oil of bergamot has been popular in England since as early as the 1820s and a large portion of this book takes place in England. The caffeine will help you to focus as you struggle to find the logic in your own life, which I will say right now is very little, and the sweet hot drink will also relax you simultaneously. This will minimize anxiety and maximize understanding. As an added bonus, you will feel like a true Brit while you read the phrase "Old Chap" several times over the course of a few pages. Bloody marvelous!